G. Hibbert (1757-1837); W. Esdaile (L. 816 and L. 2617) [is this sale lot? ], his inscription on verso: 1833 WE 10x Hibberts Colln Anonymous; Succi Limited, London; purchased from Succi on the Fellows 40th Anniversary Fund with special assistance of Mrs. Alexandre Rosenberg, in May, 1991. Ms. dogale single leaf, written and illuminated in Venice, Italy, ca. 1567-1599. Text: Decree of Doge Pietro Loredan appointing Antonio Bragadin podestà of Brescia for sixteen months from 1567. 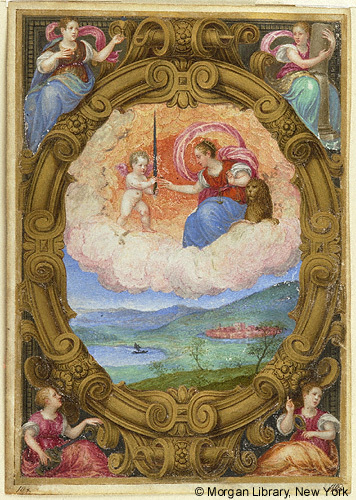 Decoration: 1 miniature depicting Venice Endowed with Dominion over Brescia (Brixen). Artist: attributed at one time to Alessandro Merli (active 1590-1608).